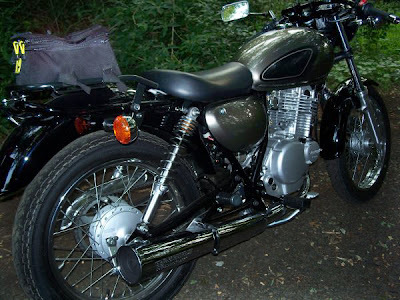 The black fenders and headlamp of the Suzuki TU250 give it a vintage look. The keywords "Royal Enfield" in a CraigsList ad drew me to these pictures of a motorcycle Royal Enfield fans might well admire. With very few simple modifications, the seller of this Suzuki TU250 brought out the British style cafe racer hidden in what otherwise looks like a utilitarian Japanese motorcycle of the 1970s. Repositioned handlebars and a rack in place of the passenger seat were all it took. Suzuki supplied the knee pads on the tank and the upswept silencer. The Suzuki's old fashioned removable headlamp, out-in-the-open speedometer and wire wheels do the rest. 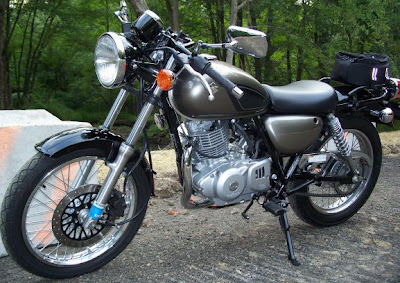 Unlike some other motorcycles, the Suzuki does not hide the fact that it lacks a tachometer by sporting a second can filled only with idiot lights. I love the honesty of that. Suzuki catalog illustration makes the TU250 look plain. Suzuki is almost unique, I think, in posting online catalog pictures that make its motorcycles look as dull as kitchen appliances. 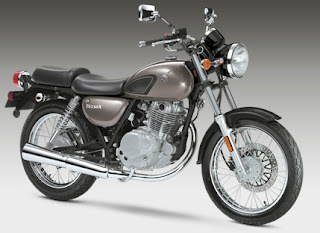 The company's photo of the 2012 TU250X, in particular, shows a mud-brown, upright and uptight motorcycle with the handlebars of a Texas steer. Ugh. The TU250 advertised by Larry Picarello in New York looks vastly better. It appears lithe and racy and the color is much less muddy in his pictures. It's far sportier in person; the muffler looks like a rocket. 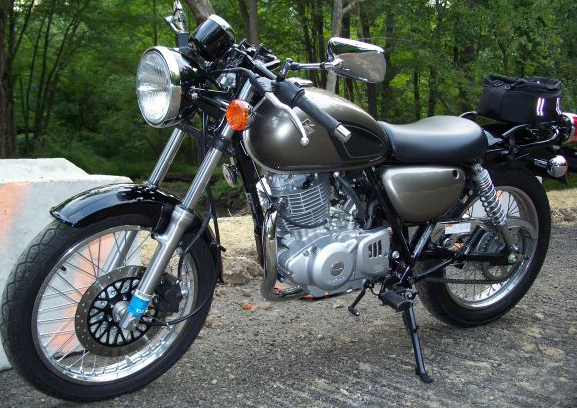 I've written before that I thought people who like Royal Enfields might like the TU250X as well. Both are single-cylinder motorcycles that share an obvious British heritage in design if not manufacture. The MSRP of the Suzuki is $4,099, which is certainly competitive. "I've owned other 'thumpers': Ducati 160, Ducati 450 R/T Desmo, Honda Ascot 500, but never a Royal Enfield. They look great! My current rides include a Suzuki DL650 Vstrom, Yamaha Tmax, Honda PCX, and a fleet of Puch mopeds from stock to highly modified." So. Like I said: same folks.